Time for another carnival over at 5 Minutes for Books today. 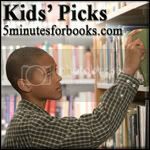 This time we're here to talk about books our kids have selected as favorites. What do your kids like? Your grandkids? A niece or nephew? Or, perhaps your kid-at-heart self?! Right now my son's top pick of favorite books to read (and read and read again!) is Panda Bear, Panda Bear, What Do You See? 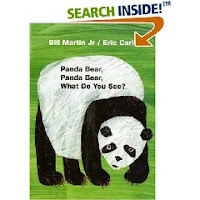 written by Bill Martin and illustrated by Eric Carle. This book was gifted to us by a friend (and we'd like to say thanks!). At our last Children's Classics carnival, Jennifer at Snapshot mentioned that her children were big fans of Brown Bear, Brown Bear, What Do You See?. I didn't understand the fascination (although I did think it sounded super cute). My son seems to be siding with Amanda and Kyle on this one. Carle's illustrations are certainly bold, unique and classic. That helps. But the Panda Bear books talks about things like spider monkeys, maccaroni penguins and - best yet - WATER BUFFALOS! (We've been talking a lot about the water buffalo around here since receiving these books.) Who'd have thunk it? It's a great book and we are enjoying it. Of course, I should have known, considering the source of the recommenation in the first place . . .
We love the Eric Carle books!! My daughter enjoyed the Polar Bear, Polar Bear, What Do You Hear?, especially after I bought the matching stacking blocks, too. You know that's actually one book that we haven't really read. It's on the audio book version that I recently reviewed. I'm glad you both love them! Eric Carle is amazing, isn't he? I'm going to have to get my son one of these soon... Great post! We love Eric Carle! It was the theme we went for, for our last child! Love that catepillar! Our favorite Eric Carle books are Does a Kangaroo Have a Mother Too? and A House for Hermit Crab. He's great. Love the illustrations!